Two Wii U games have been combined to form a family-friendly platforming extravaganza on Switch. New Super Mario Bros. U Deluxe is a side-scrolling platformer on Switch that combines two Wii U games -- New Super Mario Bros. U and New Super Luigi U -- into one package. The game allows up to four players to team up (in the same room) to complete 164 platforming levels, with the goal of defeating Bowser and his minions after they take Princess Peach captive. Each level asks players to run from left to right across the screen (or sometimes swim) while avoiding (or defeating enemies), jumping on (and off of) platforms, collecting coins, and more to reach a flag pole at the end before time runs out. By default, users can choose from five playable characters: Mario, Luigi, (yellow) Toad, Toadette, and Nabbit. Toadette and Nabbit are recommended for youngsters or new gamers, as they have certain advantages while playing. 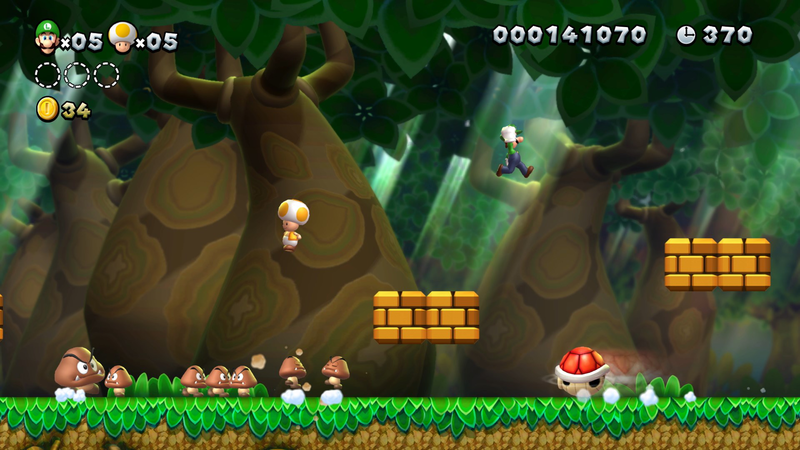 For instance, players can collect a crown while playing as Toadette, which turns her into Peachette, and gives her boosts, such as the ability to double jump. Nabbit, meanwhile, is the “easiest” character in the game, as he will not take damage from enemies, among other advantages. New Super Mario Bros. U Deluxe is available to purchase physically and digitally for $59.99 on Switch. The game is rated E for Everyone by the ESRB. Check out the first 14 minutes of New Super Mario Bros. U Deluxe in our SuperParent First Look below to see the game in action.